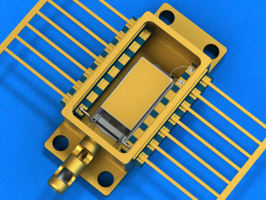 “Butterfly” packages is the standard format for optical Telecom transmissions and laser diode pumps. 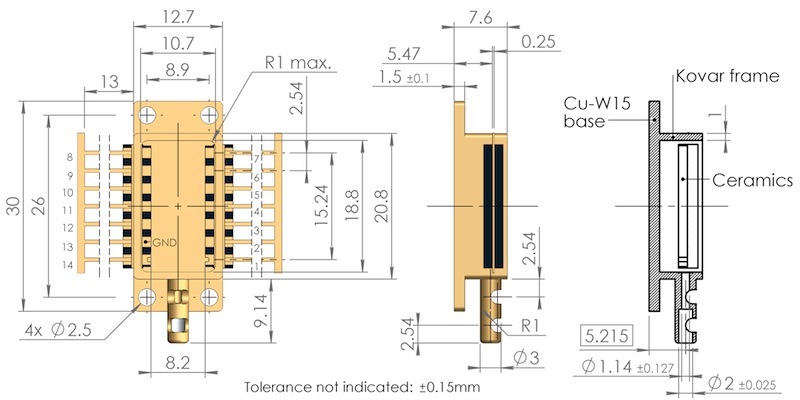 The most common type is 14pin package with CuW of CuMo base plate for better thermal conductivity. 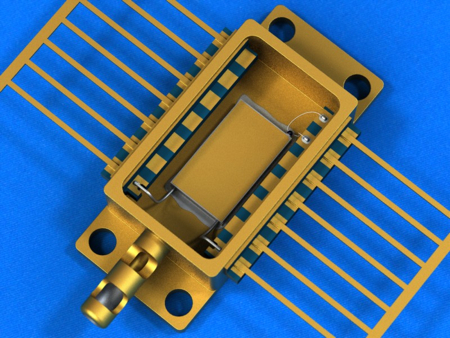 The open space inside allows to install a thermoelectric cooler with dimensions up to 10x16mm. 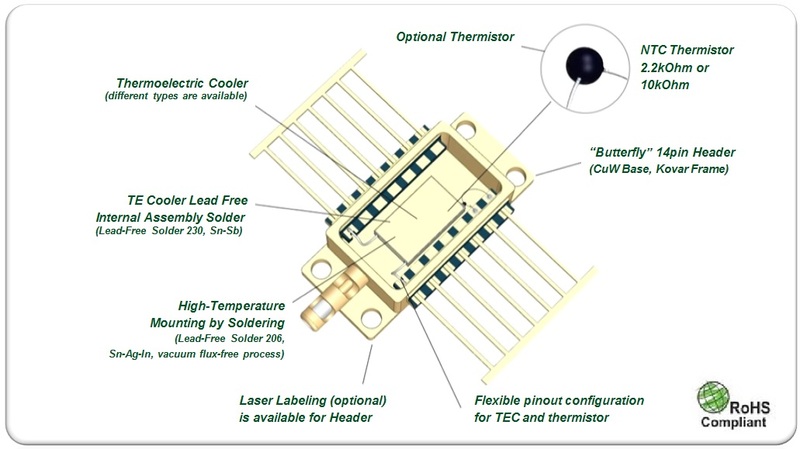 RMT Ltd provide a range of sub-assemblies - thermoelectric cooler installed in “Butterfly” package - with cooling capacity up to 25W (at standard room conditions). 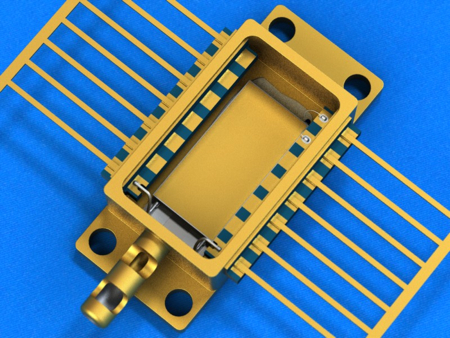 The sub-assemblies are based on RMT thermoelectric cooler Series: ML06, ML07, MDL06 and MD10. 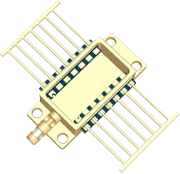 Wide range of manufacturing options is available - ceramics material and surface conditions, pinout configurations, thermistors and other optimizations for final application. Fig.1 - Common solution with 29 couples TEC from ML06 Series. 6.0x10.2mm thermoelectric cooler, height 1.6mm. 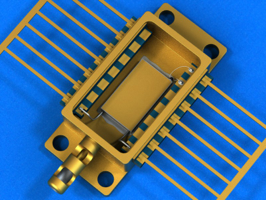 Fig.2 - Low-height 29 couples thermoelectric cooler on AlN 0.25mm ceramics. 0.9mm height. Fig.3 - HD technology thermoelectric cooler from MDL06 Series. 0.9mm height, 7x15mm cold side. 25W cooling capacity. Fig.4 - Regular solution with 35 couples thermoelectric cooler from ML07 Series. 6x12.2 cold side, AlN ceramics, 1.6mm height. Note: There are several thermoelectric coolers series optimized for mounting in “Butterfly” 14pin package: ML06, ML07, MDL06 and MD10. The difference between series is in combination of performance parameters. ML06 Series contains common telecom industry thermoelectric coolers. Sub-assemblies with ML07 Series TECs have the increased cooling capacity. MDL06 Series thermoelectric coolers have up to 100% higher Qmax value and recommended for applications with high heatload. Solutions with MD10 TECs have special combination of Imax/Umax parameters. 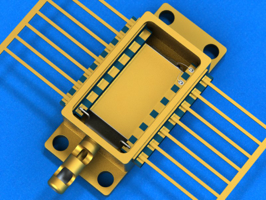 ML06, ML07 and MDL06 Series thermoelectric coolers are available on different ceramics - Al2O3 and AlN. Please, select the series and(or) ceramics type to get the list of standard sub-assembly solutions and datasheets. 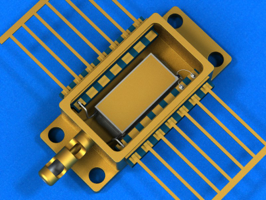 Note: RMT Ltd provides the sub-assemblies - thermoelectric coolers, mounted in “Butterfly” packages. The company doesn’t manufacture the headers or provide headers separately. The mounting service is also available on Customer’s headers upon request.